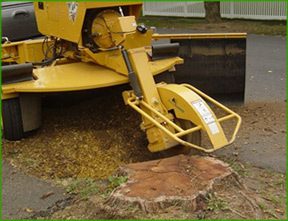 We use a machine, called a stump grinder that is passed back and forth over the tree stump hydraulically and slowly "grinds" away the stump 1 inch to 4 inches at a time. This is done back and forth and then down to an approximate depth of 12 inches to completely remove the stump. After we complete the grinding we then move our equipment and rake all the material back into the hole. Once we are done you can plant flowers, trees, add quality topsoil and put sod right on top to show off your new nice and neat lawn. This process can take from 10 minutes to 2 hours depending on the size of the stump and its location. Here is the original tree stump before we do anything. As you can see it is near the street and a sidewalk. We can still effectively remove the stump thus eliminating the eyesore and the tripping hazard while also improving your property value! Here the side to side passes have begun. 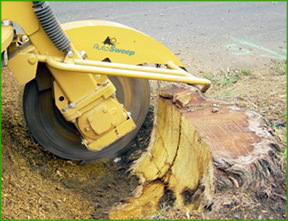 The precision of the equipment allows the stump to be removed without damaging the street which is right next to the stump. Finally after some hard work the stump is completely gone and you are left with a pile of mulch which we then use to fill in the hole. 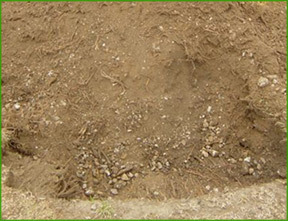 It can then be finished with good topsoil, seed or sod for a nice clean look.